When it comes to food tourism, Singapore punches way above its weight. in 2017, it attracted 17.7 million international tourists, which is more than 3 times the population of the city. Many visitors arrive in Singapore to experience the diverse food on offer. You can indulge in delicious food for as little as $5 in the country’s famous Hawker Centres. These are huge complexes full of individual and unique places to grab a bite to eat. If you’re looking for something a little more extravagant, Singapore has an array of restaurants to choose from. Almost every single food type in the world is available to choose from, whether it be Singaporean, Chinese or American. But with so much choice, where are the best places for you to visit for a tasty snack? and what are the dishes you simply must try? Some of Singapore’s leading food bloggers have created this handy food guide to help you discover the best that Singapore has to offer. These guys live and work in the city, so really know what they are talking about when it comes to food. You’re in good hands! Singapore is home to a vast array of restaurants, with each featuring an authentic and unique approach to food. The city boasts over 25 Michelin starred eateries ranging from high-end restaurants to more affordable venues. Hong Kong Soya Sauce Chicken Rice & Noodle’s chicken rice dish recently became the world’s cheapest Michelin-star meal, costing only $1.42 per serving. Whatever your taste, you’re sure to find a new favourite place to visit for food in Singapore. A modern Australian restaurant, Cheek by Jowl serves up a mouthwatering selection of flavoursome Aussie food. The eatery also boasts a wide selection of organic and biodynamic wines. Alexis suggests to “go for lunch for better value!”. We think it’s a good idea! The recently opened Salted Plum is fast becoming a firm favourite of the Singapore food scene and is the creation of the same people behind the popular Five Ten restaurant. Featuring a delicious serving of Taiwanese inspired food, the restaurant is one that Alexis would recommend! Rakuya is so good, Eatbook SG can’t stop raving about it: “I just visited this new Omakase joint, and it’s great because the dishes marry Japanese ingredients with local flavors”. We highly recommend you pay the restaurant a visit. This eatery isn’t a restaurant, but it’s so good Eatbook SG simply had to recommend it, adding “it’s not a restaurant but hit up Tarte by Cheryl Koh if you are looking for a sweet treat. Our favorite tarte is her Dark Chocolate”. Pay it a visit if you have a sweet tooth! This Michelin-starred dining experience is one of Singapore’s must-visit restaurants. Located inside the popular Ritz Carlton hotel, this Cantonese restaurant offers filling and flavorful cuisine in a modern environment. Try the poached rice and lobster recommended by the Ordinary Patrons! The Kok Sen Restaurant has been around for over 50 years and has stood the test of time. Famous for its delicious zi-char food, the restaurant offers quality cuisine for reasonable prices. It often gets very busy because of its appetising menu, so make sure you make a reservation to guarantee yourself a table. Candlenut’s claim to fame is that it was the world’s first Michelin-starred Peranakan restaurant, and deservedly so. Taking a more contemporary approach than other eateries, the restaurant specialises in traditional Straits-Chinese cuisine. Singapore is famous for its world-renowned Hawker Centres, vast food courts brimming with hundreds of independent vendors who serve delicious and authentic street food. Hawkers are the best place to find quality food for a small price and are always jam-packed with tourists. It’s one of the must-try experiences in all of Singapore. Two food stands located in Hawker Centres became the first street food vendors to be awarded a Michelin star for the quality and excellence of their food. Most have convenient locations and are easy to travel too. Newton food circus is one of the most picturesque Hawker centres in Singapore, with its large outdoor seating area. When it comes to food, make sure you try “Alliance Seafood’s Sambal Stingray, and other stalls for an oyster omelette, Hokkien noodles and fried rice. They are all really good!”, suggests Alexis. This Hawker centre is popular with locals and tourists alike, which is always a good sign! It boasts some of the most delicious Singaporean food in the city-state. Alexis advises that “when visiting Maxwell Food Centre, Tian Tian Chicken Rice is the obvious one to try, but I really like the Laksa as well”. Pizza seems to be the preferred dish of The Bedok Marketplace. Eatbook SG boasts “I love The Bedok Marketplace, which houses Mr. Kneady; a hawker stall that does chewy sourdough pizzas. A favorite among the team is their Art of War dessert pizza that has creme fraiche, bananas, blueberries, streusel, and caramelised white chocolate chips”. Located in the central business district of Singapore, Amoy Street Food Centre is one of the easiest to commute to. The centre is home to some of the best hidden gems in the city, and Eatbook SG recommends visiting two special stalls once you arrive: “I frequently visit Amoy Street Food Centre for two stalls: Pepper Bowl and Han Kee Fish Soup”. The Bendemeer Food Centre is only two minutes away from the Boon Keng MRT Station, so it’s easy to visit. However, make sure you arrive early to avoid a long wait! Eatbook SG warns “the stalls at Bendemeer Food Centre always boast a long queue, and the ones to join are Yong Xiang Carrot Cake and Heng Kee Lor Mee”. One of the most popular places in Singapore to indulge in Nasi Padang and other Malaysian delicacies, this Hawker can get extremely crowded due to its popularity. Among its 5 floors of delicious food, you’re bound to find something to enjoy! Recently reopened in 2016 after renovation work was complete, this Hawker is a little bit out of the way, but very much worth a visit. Located in the north of Queenstown, you can expect a wide range of food to satisfy your taste buds! Sassy Mama tells us that “There is no one distinguishing factor to make a Hawker centre child-friendly, but Lau Pa Sat is clean and open and central. There’s everything on offer from Indian food to Korean, Western plus must-tries Singapore signature Chilli Crab and Rojak salad. Adults should try the hard-to-find healthy Hakka lei cha fan Thunder Tea rice dish and kids will love the chicken or beef satay (hold the peanut sauce if your kids have allergies), dim sum like the ever popular har gau prawn dumplings and chicken rice (without the chilli sauce for young ones)”. Dim Sum is a style of traditional Chinese cuisine that is a series of bite-sized portions of various food types served in small baskets. Originating as a comfort food, the dish has become a firm favourite with tourists to Singapore and is normally served with tea. The main staple of Dim Sum is steamed dumplings, which can be presented with a range of ingredients from chicken and vegetables to hoisin sauce and shrimp. It’s often said that trying Dim Sum is one of the best ways to immerse yourself in Chinese food and Singaporean culture. If you’re travelling to Singapore for an authentic Dim Sum experience, you won’t be disappointed. This Dim Sum eatery is ideal if you’re looking for an authentic Dim Sum experience, featuring a variety of cooking methods and distinctive ingredients. Alexis suggests that “both Imperial Treasure Cantonese Cuisine and Treasures Yi Dian Xin does really good classic Dim Sum”. The delicious food married with the decor makes Paradise Dynasty very special, with the restaurant modelling itself on imperial China. Alexis raves that “Paradise Dynasty has really good xiao long bao (steamed soup dumplings) in different colours/flavours”. Situated in Singapore’s bustling Chinatown area, Tac Po is a firm favourite with locals. Alexis recommends trying Tac Po for “a ‘quick and dirty’ fix, much like Swee Choon back alley dim sum”. Canton Paradise has restaurants in several locations around Singapore, so no matter where you are you shouldn’t be too far away from their famous Dim Sum. “Even though it’s a chain restaurant, Canton Paradise’s dim sum is really impressive, as they are not stingy with their ingredients and fillings”, Eatbook SG tells us. Swee Choon is one of the most well-known Dim Sum restaurants in Singapore, with over 40 years’ experience in creating unique and authentic Dim Sum dishes. Make sure you try this place out if you’re travelling with friends “since they have a large variety of cheap and good dishes”, Eatbook SG suggests. Madame Fan boasts that they have introduced a new era of Chinese dining to Singapore. One of Eatbook SG’s favourite places to visit for Dim Sum, they tell us that “the newly-opened Madame Fan does a surprisingly good dim sum, although it is very, very pricey”. The award-winning Crystal Jade Golden Palace offers a contemporary dining experience in beautiful surroundings. The restaurant uses the very finest ingredients to recreate regional specialities. Open since 1988, Wah Lok matches an elegant and contemporary interior with delicious food. Ordinary Patrons recommends Wah Lok “because they are consistent, quality is always high and service standards are excellent”. We highly recommend a visit but be warned, they only serve Dim Sum during Lunch hours. Serving authentic Cantonese cuisine, Red Star is located in the centre of Chinatown and boasting specialities such as America Duck and Fried Yam Pots. The restaurant is also child-friendly, with Sassy Mama telling us that “Red Star has pushcarts which our kids find fun”. Well worth a visit if you’re travelling with young children! Recently featuring in the World’s Top 10 Restaurants by the New York Times, Din Tai Fung is an extremely popular restaurant. Sassy Mama recommends that you and your family visit, suggesting “Din Tai Fung is a family favourite just for the ease of dining and the simple menu of Xiao Long Bao”. Check out the must-try eats and food advice HERE! Download the Local Food Lover’s Guide to Singapore! 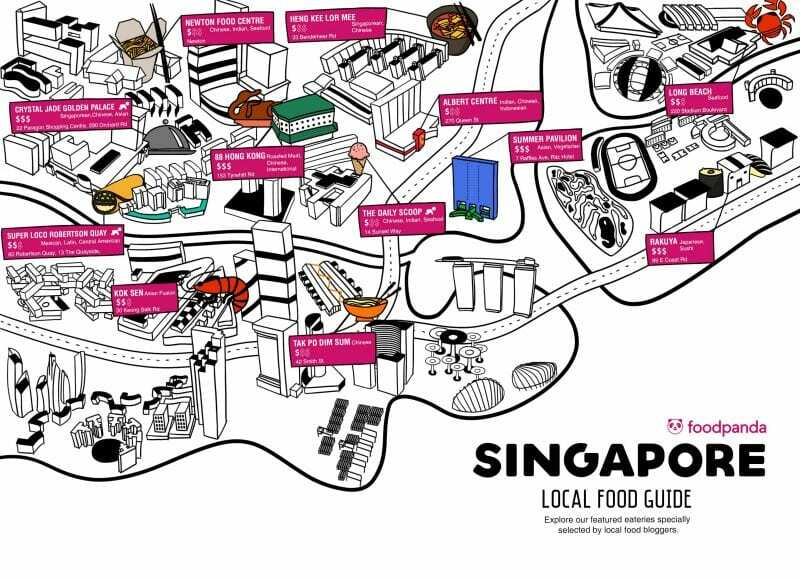 Have you tried any of the eateries on the local food lover’s guide to Singapore?